An interesting chart has been making the rounds on the internet and social media. 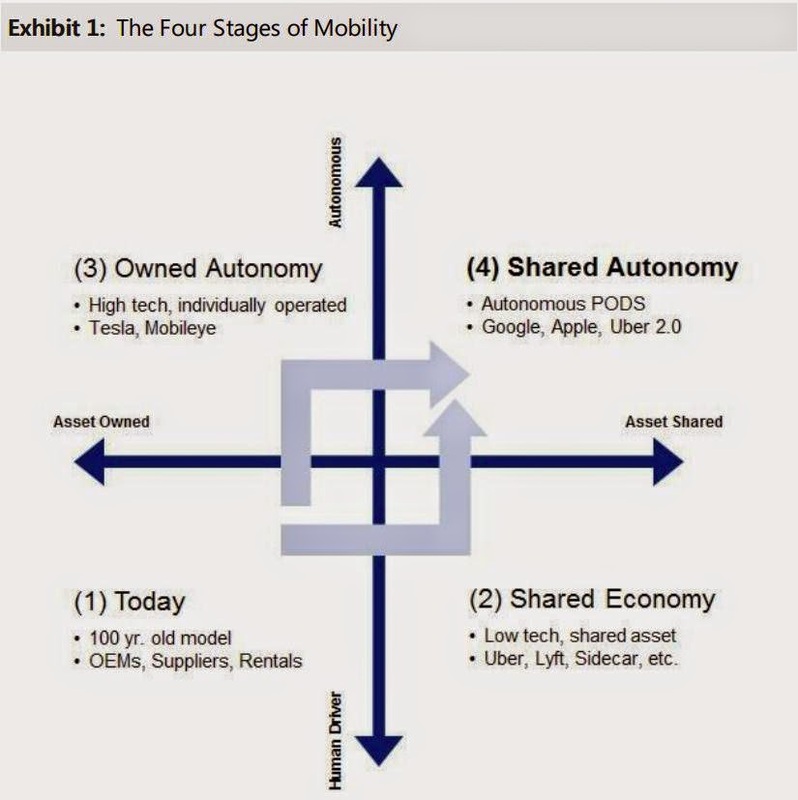 Created by Adam Jonas, a financial analyst at Morgan Stanley, it purports to show “The Four Stages of Mobility,” outlining a transition from today’s car-centric model to tomorrow’s even more car-centric (yet “autonomous”) model. Jonas charts a movement from 1) Today’s system of automobilty, through 2) the growing “Shared Economy” represented by companies like Uber and Lyft, and 3) a coming stage of “Owned Autonomy” made possible by self-driving cars, to 4) the final stage in which these trends come together as “Shared Autonomy,” in which nobody owns cars, but we are all instead shuttled around cities in driverless taxis straight out of a Robert Heinlein novel. There is one big problem with this: if these trends continue, the future they are taking us towards will not be as rosy as the term “shared autonomy” suggests. Because although Jonas has correctly identified two important trends which are taking us along this path, in the chart above these trends are mislabeled – and more importantly, misunderstood. In fact, even the present is not properly represented on the chart. 1. Today. Jonas, not surprisingly, chooses to trace “today’s” model back 100 years, presumably aiming for the “Model T moment” in which technological innovation and the factory system came together to put out a mass-produced, affordable automobile. This was of course an important historical event, but the car industry, and the economy as a whole, moved away from the resulting “Fordist” system a long time ago. A better description for our current system is the “Post-Fordist” condition beginning about 40 years ago. This is not nitpicking. The shift from Fordism to Post-Fordism came with an erosion of workers’ power (goodbye unions) and the resulting “flexibilization” of the workforce. Not coincidentally, this occured along with a flat-lining of real wages, leading to an increasingly unhealthy reliance on lines of credit. Which means that that “Asset Owned” side of Jonas’s left-right continuum should instead be labelled “Commitment through Debt.” We like to think we own our cars, houses, etc., but often the truth is we owe them. Recognizing Post-Fordism is important because it sets the stage for the two major trends which, according to the chart, are leading us to the future. These are not as new as we might be tempted to think, but are the continuation of trends which have already been in operation for decades. They represent, not a break with the present, but its continuation into the future. 2. It takes a bit of preternatural naiveté, or obstinacy, for someone to still insist, in 2015, that the so-called “Sharing Economy” has anything to do with sharing. Perhaps for this reason, Jonas prefers the term “shared economy” and highlights the “sharing” of assets made possible by pseudo-taxi companies like Lyft, Uber, and Sidecar. The obvious question arises – if using Uber counts as “sharing” assets, shouldn’t riding the bus, streetcar, or even a plain old taxi, as well? If there is anything new about the “sharing economy,” it isn’t the very old habit of “shared assets.” So what is driving this trend? What really is going on, is a shifting of economic risk from corporations to workers; the Post-Fordist system taken to the next level. This is Precarious Society. Uber doesn’t have to own any cars, or even hire employees (if they could get away with it, they wouldn’t pay for insurance, either). While Uber, reportedly, rakes in untold riches, the drivers bear all the costs, and risks, of doing business. This is certainly a growing economic trend today, though there isn’t much about it to celebrate. I’ve labelled this side of the left-right continuum “Access through Credit.” You may be wondering, how is this really different from “Commitment through Debt?” “Credit” and “debt,” of course, are two sides of the same coin. You can’t have one without the other. But there is one thing about coins—it is hard to see both sides at the same time. So think of these two poles, not as a qualitative opposition, but as a reference to which side of the credit/debt coin is face up, and thus made visible. What makes services like Uber and Lyft convenient is the easy access they provide for any rider with credit. That this credit is also debt is obscured (by getting rid of the physical exchange of money at the end of the ride); even more importantly obscured is the debt drivers commit to as they drive us around in their “own” cars. 3. Jonas’s next stage is “Owned Autonomy.” Having disposed of the chimera of “ownership,” let’s focus instead on this word, “autonomy.” As attractive as it sounds, the term is being used not to refer to the “autonomy” of riders in driverless vehicles, but to that of the vehicles themselves. Apparently “they” will no longer need “us.” It’s a vision straight out of those unintentionally dystopian commercials for the “internet of things” in which all the important business is automated while humans are reduced to standing around, looking useless and disoriented, and occasionally getting in the way. But really, “autonomy” is still not the right word for it. Just as the old-fashioned “automobile” was never truly “auto-mobile,” but relied, not only on human drivers, but an entire concrete infrastructure built into cities and smeared across the countryside, so the interconnected “autonomous vehicles” of the future will be even more dependent on the interconnected systems of which they are part. To see this as “autonomy” is to miss the deeper reality, which will be control. 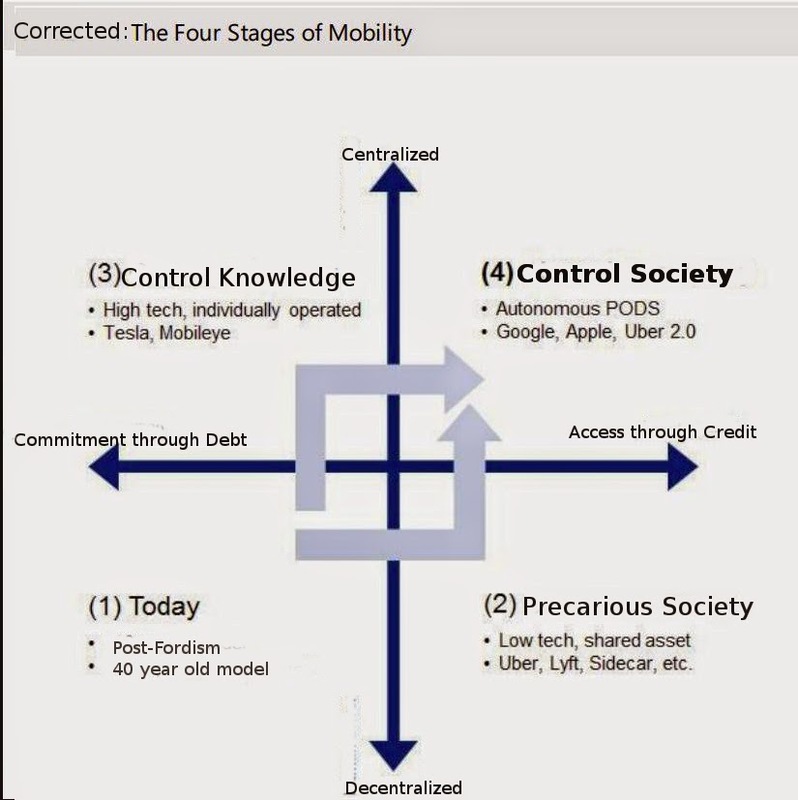 Which is why the important movement reflected in the chart’s up-down continuum is not away from “Human Drivers” to “Autonomous” cars, but from a relatively decentralized system (which relies on large numbers of people knowing how to drive) to an increasingly centralized system (relying on the specialized knowledge of a small number of people who design and manage the system). And why do we need these “autonomous” vehicles in the first place? We can of course hope that driverless cars will be safer, and more ecologically sustainable than cars today, but that is not at all the reason why they are being built. Self-driving cars are just a benchmark along the path to computerized systems that can solve complex, real-world problems on the fly. The biggest reason to want to create such a system is to reduce the power of labor, by reducing the knowledge that workers are required to have to do any given job. This goal – increasing Control of Knowledge – is the whetstone that hones the cutting edge of today’s push toward automation, including the “robot car.” More important than the technology is the desired product: a de-skilled workforce provided with just enough information to complete tasks, but not enough to exert control over their own working conditions. 4. Finally, taking the “shared” from “shared economy” and the “autonomy” from “owned autonomy,” Jonas leads us to “Shared Autonomy.” This is certainly a very attractive term, invoking a utopian (“autopian,” says Jonas) blend of both individual self-governance and social responsibility. It evokes the ideal society long championed by visionaries as diverse as Karl Marx, Mikhail Bakunin, Jesus Christ, and Winnie-the-Pooh. And me too! It sounds great, bring it on! Gaining mobility by purchasing a car (“Commitment through debt”) is so last century. “Access through credit” is more in line with the dreams of control society. And what better way to control mobility than through self-identifying devices that we willingly purchase and carry, that buy us access into a network enabled by uninterrupted connectivity and surveillance? Meanwhile, the centralized, expensive high tech of the “autonomous” vehicle means that the provision of mobility is likely to consolidate in a few, well-funded, powerful hands. Jonas lists some likely suspects: “Google, Apple, Uber 2.0” (avert!). Now how utopian does this sound? The emerging tech of driverless cars makes an interesting point of entry into this question of where our society is going, but we shouldn’t blame the technology itself. The problem isn’t driverless cars, but why we think we need driverless cars (not to mention, cars), why we (in general) are so easily roped into supporting a vision of the future that, should it arrive, will benefit the few more than the many, and be founded on the same irrational, unquestioned presuppositions that underlie our current economic system. It is high time we looked more critically at emerging technologies like the driverless car (and even more importantly, ubiquitous computing), instead of taking their inevitability for granted. Deleuze, Gilles, “Postscript on the Society of Control,” October, Vol. 59. (Winter, 1992), pp. 3-7. George, Henry. “What The Railroad Will Bring Us.” The Overland Monthly 1, no. 4 (October 1868): 297–306. financial analyst at Morgan Freeman, it purports to show"
I was reading up on the history of credit cards many a year ago and it was frightening to see that just at the time that real wages started stagnating in 1973 the rise of unsecured credit card debt started taking off. The eerie part was that the growth rate tracked the former growth rate in real wages, promoting a wealth delusion. Though to be fair, the author didn't make that connection, it's just my speculation. Hi Kevin, I think your speculations are correct. Shifting consumption spending from wages to credit would allow for more concentration of wealth (as people pay interest), while allowing growth to continue (as they continue to spend). Thanks, I was taking a seminar in the gewography of finance at the time and was thinking of writing a paper on the subject, but I wound up getting bogged down in something else and wound up dropping out. By the way your history of taxis in SF (how I came across this) was excellent.